Not to be confused with History of the Jews in the Arabian Peninsula. Map of the territory and area covered by present-day Saudi Arabia. The history of Jews in Saudi Arabia refers to the history of Jews in that part of the Arabian Peninsula that is now Saudi Arabia. It is a history that goes back to Biblical times. The first mention of Jews in the areas of modern-day Saudi Arabia dates back, by some accounts, to the time of the First Temple. Immigration to the Arabian Peninsula began in earnest in the 2nd century CE, and by the 6th and 7th centuries there was a considerable Jewish population in Hejaz, mostly in and around Medina, in part because of the embrace of Judaism by such leaders as Dhu Nuwas; who was very aggressive about converting his subjects to Judaism, and who persecuted Christians in his kingdom as a reaction to Christian persecution of Jews there by the local Christians and Abu Karib Asad. According to Al-Masudi the northern part of Hejaz was a dependency of Kingdom of Judah, and according to Butrus al-Bustani the Jews in Hejaz established a sovereign state. The German orientalist Ferdinand Wüstenfeld believed that the Jews established a state in northern Hejaz. There were three main Jewish tribes in Medina before the rise of Islam in Arabia: the Banu Nadir, the Banu Qainuqa, and the Banu Qurayza. Banu Nadir was hostile to Muhammad's new religion. Other Jewish tribes lived relatively peacefully under Muslim rule. A historical journey to visit far-flung Jewish communities was undertaken by Rabbi Benjamin of Tudela from 1165 to 1173 that crossed and tracked some of the areas that are today in the geographic area of Saudi Arabia. 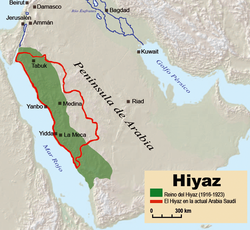 One map of his travels in the areas of present-day Saudi Arabia shows that he stopped at Jewish communities living in Tayma and Khaybar two places that are known to have a longer significant historic Jewish presence in them, the Battle of Khaybar was fought between Muhammad and his followers against the centuries-long established Jewish community of Khaybar in 629. Tudela's trek began as a pilgrimage to the Holy Land. He may have hoped to settle there, but there is controversy about the reasons for his travels. It has been suggested he may have had a commercial motive as well as a religious one. On the other hand, he may have intended to catalogue the Jewish communities on the route to the Holy Land so as to provide a guide to where hospitality may have been found for Jews travelling to the Holy Land. He took the "long road" stopping frequently, meeting people, visiting places, describing occupations and giving a demographic count of Jews in every town and country. One of the known towns that Benjamin of Tudela reported as having a Jewish community was "El Katif" located in the area of the modern-day city of Hofuf in the northern part of the Arabian Peninsula. Al-Hofuf also Hofuf or Al-Hufuf (Arabic: الهفوف‎) is the major urban center in the huge Al-Ahsa Oasis in Eastern Province, Saudi Arabia. The city has a population of 287,841 (2004 census) and is part of a larger populated oasis area of towns and villages of around 600,000. It is located inland, southwest of Abqaiq and the Dhahran-Dammam-Al-Khobar metropolitan area on the road south to Haradh. There was a small Jewish community, mostly members of Bnei Chorath, lived in one border city from 1934 until 1950. The Yemeni city of Najran was conquered by Saudi forces in 1934, absorbing its Jewish community, which dates to pre-Islamic times. With increased persecution, the Jews of Najran made plans to evacuate. The local governor at the time, Amir Turki ben Mahdi, allowed the 600 Najrani Jews a single day on which to either evacuate or never leave again. Saudi soldiers accompanied them to the Yemeni border. These Jews arrived in Saada, and some 200 continued south to Aden between September and October 1949. The Saudi King Abdulaziz demanded their return, but the Yemeni king, Ahmad bin Yahya refused, because these refugees were Yemenite Jews. After settling in the Hashid Camp (also called Mahane Geula) they were airlifted to Israel as part of the larger Operation Magic Carpet. According to Yemenite Jewish tradition, the Jews of Najran traced their origin to the Ten Tribes. There has been virtually no Jewish activity in Saudi Arabia since the beginning of the 21st century. Jewish (as well as Christian and other non-Muslim) religious services are prohibited from being held on Saudi Arabian soil. When American military personnel were stationed in Saudi Arabia during the Gulf War, permission for small Christian worship services was eventually granted, but Jewish services were only permitted on US warships. 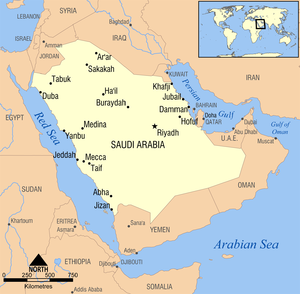 Census data does not identify any Jews as residing within Saudi Arabian territory. Persons with an Israeli government stamp in their passport or who are openly Jewish are generally not permitted into the Kingdom. In the 1970s, foreigners wishing to work in the kingdom had to sign an affidavit stating that they were not Jewish and official government forms granting foreigners permission to enter or exit the country, do ask for religious affiliation. During the first Gulf War, American servicemen and women who were Jewish were allowed into the kingdom, but religious services had to be held discreetly on base and alternative "Protestant B" dog tags were created, in the event that a Jewish serviceman or woman was taken prisoner in Iraq. In late December 2014, the newspaper Al-Watan reported that the Saudi Labor ministry website permits foreign workers of a variety of different faiths, including Judaism, to live and work in Saudi Arabia. A source within the ministry said, in effect, that Israelis were not allowed to enter Saudi Arabia, but Jews of other nationalities would not have the entry ban applied to them. In practice Christians and Jews may hold religious services but only in their homes and may not invite Muslims. ^ Ha-Redeye, O.: "Rescuing the Oppressed Doesn't Just Spoil War", The Journal of Scriptural Reasoning, (2009) 8(1). ^ "PDF: The Itinerary of Benjamin of Tudela trans. Nathan Marcus Adler. 1907: Includes map of route (p. 2) and commentary" (PDF). teachittome.com. Retrieved 2010-06-09. ^ Shatzmiller, Joseph. "Jews, Pilgrimage, and the Christian Cult of Saints: Benjamin of Tudela and His Contemporaries." After Rome's Fall: Narrators and Sources of Early Medieval History, p. 338. University of Toronto Press: Toronto, 1998. ^ Shatzmiller, Joseph. "Jews, Pilgrimage, and the Christian Cult of Saints: Benjamin of Tudela and His Contemporaries." After Rome's Fall: Narrators and Sources of Early Medieval History, p. 347. University of Toronto Press: Toronto, 1998. ^ Josephine Bacon. Consultant editor: Martin Gilbert. "From Abraham to the Destruction of the Second Temple": The Illustrated Atlas of Jewish Civilization, pp. 30-31. Quantum Books. London, 2004. ^ a b The Complete Idiot's Guide to Understanding Saudi Arabia. Alpha Books. December 21, 2007. Retrieved 2010-10-09. ^ "CIA - The World Factbook - Saudi Arabia". The World Factbook. The Central Intelligence Agency. ^ "Saudi Arabia in the 1970s - part 1 - ARAMCO, Riyadh - visitor's impressions". May 2005. Retrieved 12 May 2011. ^ Kornbluth, Doron. "The Dog Tag Dilemma - Stories - Chanukah - Hanukkah". Chabad.org. Retrieved 12 May 2011. ^ "Saudi Arabia says open to Jewish workers". Stillman, Norman. Jews of Arab Lands, Jewish Publications Society, 1979. New Standard Jewish Encyclopedia, 1992, Encyclopedia Publishing, "Aden", "Arabia", "Hadramaut"
The Itinerary of Benjamin of Tudela. trans. Marcus Nathan Adler. 1907: includes map of route (p. 2) and commentary. Shatzmiller, Joseph. "Jews, Pilgrimage, and the Christian Cult of Saints: Benjamin of Tudela and His Contemporaries." After Rome's Fall: Narrators and Sources of Early Medieval History. University of Toronto Press: Toronto, 1998. Jewish Virtual Library: Benjamin of Tudela. This page was last edited on 25 February 2019, at 09:38 (UTC).